Allow me to make a bold statement that Instagram is disrupting the fashion industry and creating a newer business model within the fashion sector. 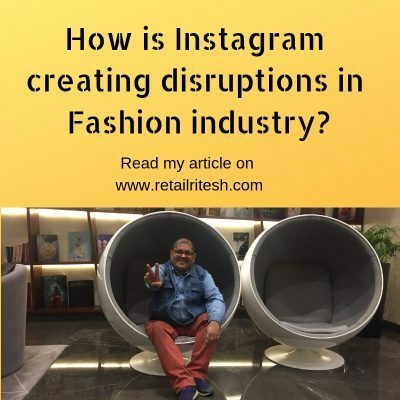 07 Apr How is Instagram creating disruptions in Fashion industry? The topic does it arouse some curiosity, if yes, then allow me to make a bold statement that Instagram is disrupting the fashion industry and creating a newer business model within the fashion sector. How is Instagram disrupting Fashion industry? Instagram over the years has become the most used social platform for the millennials. As per Statista, It has over 77.6 million active users of the platform. Firstly, let try to understand what Instagram is used for more often? Millennials are all driven by imagery and are fueled by the drive to appear better than our counterparts or friends. This social need to look glam, ahead of our peers have fueled growth for Instagram. People click themselves in their best outfits and post on a social platform; in return generate likes and followers. We have seen lots of Instagram bloggers becoming Instagram influencers and producing fashion-oriented content and rising to fame in a short span of time. Brands mull out exorbitant fees to these influencers in order to get their fashion collection spread out to their followers. How this trend or appetite for fashion and Instagram harming the sector? Consumers today have started misusing the Return policy of most of the fashion brands. They buy fashion items from stores/online for the fancy event, tucking in the tags, getting themselves clicked and returning back to the store the next day. In our Middle Eastern region, having worked in the fast fashion industry, we used to follow something we called as “gift loan” policy i.e. loaning the merchandise to Press, fashion bloggers for their shoots and in return get “outfit courtesy” sponsorship or mention in their photo credits. But in the western world, smart shoppers are misusing this concept. According to a survey by Barclaycard, nearly one in 10 UK shoppers admit to buying clothing only to take a photo on social media. After posting the picture online, they return it back to the store. This trend has given birth to brands that tailor specifically to the Instagram shopper, like the uber-popular Fashion – Nova, and Nastygal. Collections cater to social media savvy customers i.e. meant to be worn once maybe twice, photographed and then discarded. Another favorite brand of Instagram age is “Rent the Runway” brand. They have quickly understood the trend wherein consumers are misusing the return policy and hence they structured their business model towards renting the designer clothes for a fee. Successful businesses always pivot themselves to changing the environment and consumer’s demands. If your answer says Chanel then you are wrong, as per Google 2018 statistics, the most searched brand was fashion nova. Today fashion nova has 15million active Instagram users who endorse the brand day-in and day-out. Want to learn the business model of fast fashion brands, click here. The formula is simple—and profitable. Create a hyper-engaged community on social media. Sell disposable clothing for a wide range of body sizes & pricing it pocket-friendly. The result, you have a successful business model at your disposal. Communicating the fact that their merchandise is being worn by fashionistas, influencers who primarily trying to communicate that though they can afford a luxurious watch, bag, shoes, but they wear a fashion-nova dress which is HOT & TRENDY and does not burn a hole in your pocket. The very sense of HOT & TRENDY & Economical is the core of their messaging. Watch Cardi B endorsing fashion nova. If any of my readers want any help or assistance in their entrepreneurial venture or want to understand the business of fashion and beauty, then feel free to email me on riteshmohan@yahoo.com. Ritesh Mohan is a passionate retail professional with over 20 years in the Retail sector, handling some of the biggest brands in beauty, fashion and fragrances retail & FMCG sector. Ritesh has been instrumental in the growth of some of the regional brands as well in the Middle East region. He specializes in Retail management, Product development and Brand management, Retail Operations, Sales Management and Franchising & Business Management. He strongly believes in empowering business owners with his wisdom & experience of around two decades in the industry. thanks, Chris, I am glad you liked the article. Yes, Instagram is fueling new aspirations and desires which are both misused and also useful for the millennials.